Life happens! CGR Credit Union understands that unexpected overdrafts occur from time to time. 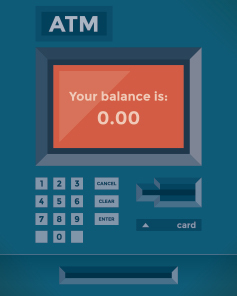 When you need it, overdraft protection can help. CGR offers two options for overdraft protection. The choice is yours which coverage you want. The Credit Union's fee of $28 per item will be deducted from the Return Guard limit. Call us at (478) 745 – 0494 or come by a branch today to learn more about these services. Ready to sign up? To opt in or out of extended coverage with your debit card, please contact a member service representative. ACH – Automatic Debits X X Contact a member service representative. You can discontinue the Overdraft Protection at any time by contacting us at (478) 745 – 0494. The consumer must repay any overdraft on his or her account within 30 days. If the account remains negative after 30 days, account may be closed at the Credit Union's discretion. CGR Credit Union will cover overdrafts on eligible accounts at their discretion up to $329.95; any amount over the limit will not be covered by the credit union.